Integrated interface means a few related functions are combined in only ONE interface, and you can adjust the size of their containing panes, even hide/show the specified pane. For example, in MS Word, the document area, navigation area and toolbar area are integrated in the main interface. And you can minimize the toolbar, close navigation, and adjust the size between navigation and document. Why need the integrated interface? Improve work efficiency - you can do more in one interface. Easy to find out the common functions – usually, the integrated functions are common for use, displayed them in one interface, you will save the time to find where are them. Screenshot 1: the main interface of our scheduling email delivery software. The main features of our automatic mail sender, please note that a few buttons contains the drop-down menu items, you can click the black Inverted triangle to know more details. Also, you can move mouse on the buttons to see the tooltips for understanding them when you are not good at our scheduling email delivery software. Lists the created email templates. 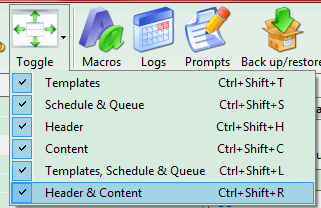 Lists the sending schedule for the selected template. Lists current emailing queue, you can watch the next sending and remove some that you do not want it be sent out here. Set the email header for current template here. Except email content, all other things are called email header in our side, such as sender account, receivers, subject, attachments, etc. 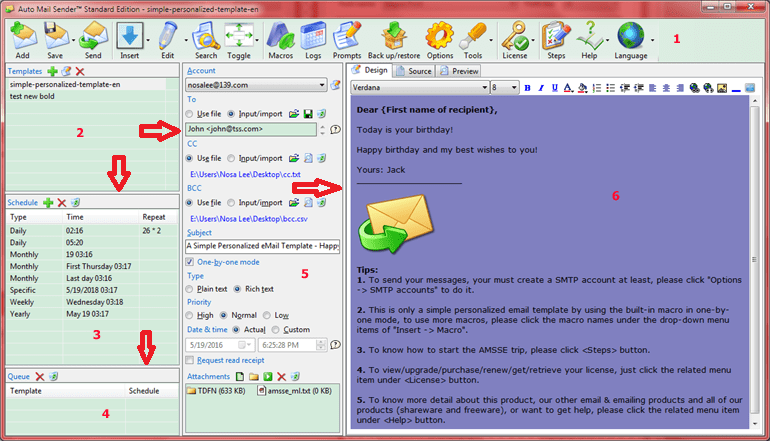 For writing/designing your email body in our scheduling sending email software. As above, these are the integrated functions, now I will introduce how to adjust the sizes and hide/show them. Adjust size: after you moved the mouse on the splitter bars as the red arrows indicate, the cursor will change, and then drag-and-drop the mouse to adjust the sizes between the adjacent panes. It is a common Windows operation. Screenshot 2: the <Toggle> function of our scheduling sending email software. Uncheck one will hide the corresponding pane, check it again will show the pane again. This feature is very useful when you are focusing on a specific area, such as when you are writing email content, you can hide all others to let you concentrate more on writing. Download AMSSE to Schedule Sending eMail for Windows!